While the Redmi series has been doing exceptionally well, Xiaomi is now gearing up to launch the Xiaomi Redmi Pro 2.
the promotional material of the alleged Xiaomi Redmi Pro 2 has surfaced in China, giving a closer look at the upcoming smartphone. For starters, the handset would be available in two variants – the base variant with 4 GB of RAM and 64 GB of storage and the premium variant with 6 GB of RAM and 128 GB of storage. 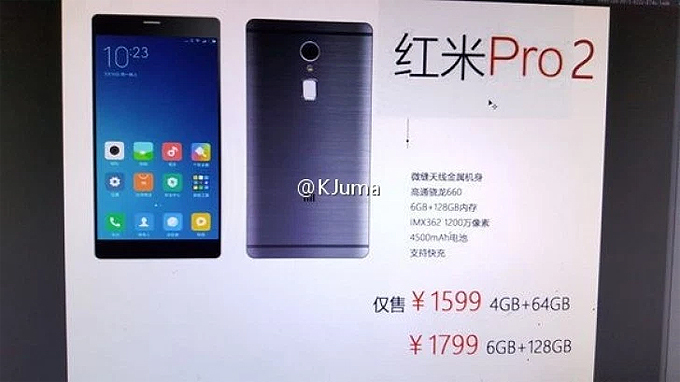 The listing suggest that the Xiaomi Redmi Pro 2 would sport a 12 MP Dual Pixel rear camera. The handset is expected to be powered by a massive 4500 mAh battery. While the remaining specs were not available, the source revealed that the handset would be priced starting at CNY 1599 (approx. Rs. 16000).